Do you know your mindset strengths? Do you know the mindsets employers want and why? Welcome to Mindset Matters. The course helps you to prioritise developing your mindset in a world where technical skills quickly become outdated. proven, pragmatic tools and techniques backed by research to drive your actions. videos, ebook, podcast, articles, and free questionnaires to deepen your knowledge and understanding. You also get an invitation to a closed Facebook Group, where you can get the support and challenge of me and other course participants to help you as you work through the content. AND you get a digital completion certificate to automatically upload to your LinkedIn profile. The course is about personal development, not assessment. You learn at your own pace, when and where you want on any device. My current work as a coach, consultant, speaker and author ensures the course content is grounded in the reality of the world of work. You also gain access to my experience of developing people and organisations in a wide range of sectors over many years, and to the breadth and depth of my network of specialists and experts. My goal is for you to walk away more impressed with yourself than with the course. Are you ready to learn and make the leap with me to reach your goal? Then click the subscribe button now at the top of the page and I’ll see you there. Coaching you to be clearer, more confident and purposeful so you take the job and career actions that are right for you. David helps you to develop and grow beyond what you think yourself capable - to progress your career, gain a more meaningful future and work identity, or enhance your current job performance. 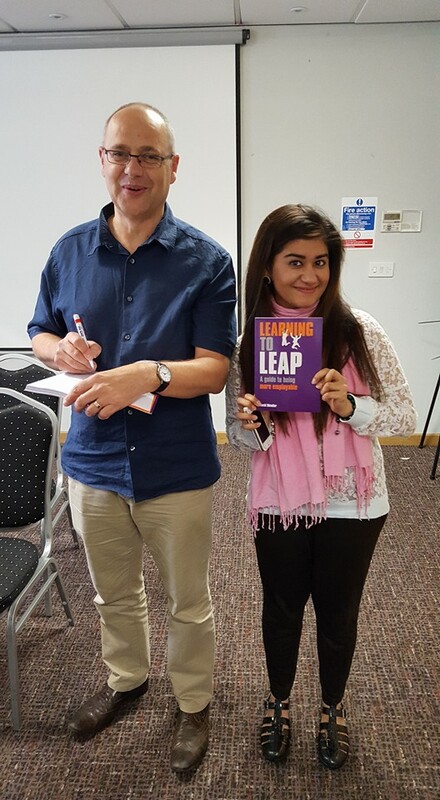 We all need to learn to leap again and again in our working lives - developing new skills, new knowledge, and adapting our mindset and behaviours for changing personal and business circumstances. Because the world does not stand still. Many people later in life say they wished they had known more when they were younger. You can avoid that trap by empowering yourself early on and navigating your career with confidence and skill. Many people focus on technical skills without embracing the mindset, attitudes and so-called soft skills that are so vital in working life. Soft skills are tough! And they are transferrable. You will have a more fulfilling and successful working life by investing in lifelong learning and understanding what it takes to be successful. This course will help you learn to leap as a young professional! David is a coach, workshop facilitator, speaker, blogger, and author on jobs, careers and employability development. Learning to Leap is his metaphor for a lifelong pursuit of personal and professional development and nourishment. Check out his 5-star Amazon book for more on developing what employers value most so you stay employable. For over thirty years, David has worked across the private, public and non-profit sectors. As an employee, he has been a consultant helping individuals, teams and organisations with their people development; head of organisational research in a police service, and a membership manager with a professional institution. He went independent in 2008. He is also a Non-Executive Director of Youth Employment UK, a social enterprise dedicated to tackling youth unemployment and a platform for the voice of young people. Follow David on Twitter and reach him via Direct Message - @david_shindler - or via his website. Join the Career Navigators Community Facebook Group! Worksheet: what does this mean for you? Questionnaire: What is Your Mindset? Article: Mindset - what is it and how can it help you?